Container Intelligence Monthly tracks developments in the container shipping market, providing easy access to the data required by busy executives in the container industry. Each month the Clarksons Market Research Group gathers information from many sources, including the Clarksons broking team and the Clarksons Research Fleet Statistics database, and presents it in an 'at a glance' format. 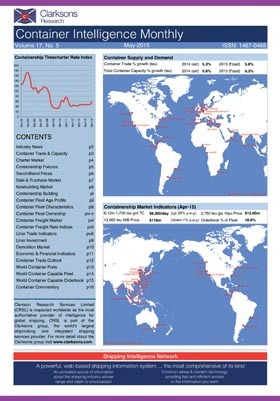 Detailed information in Container Intelligence Monthly includes analysis of the charter, secondhand, newbuilding and demolition markets alongside latest industry news, and financial, economic and port data. It provides analysis of the supply/demand picture, in the form of detailed monthly coverage of the entire liner fleet and orderbook, and global containerised trade. Forecasts of the fleet, deliveries and demolition, and trade are all provided. Container Intelligence Monthly is available in hard copy and digital format. Download sample copy (1.44 MB PDF Acrobat).